After a long and hot summer, the sun and heat have taken a toll on your vehicle. But did you know there are many preventative measures you can take to keep your car running smoothly even in the hottest of temperatures? This infographic provides pro-tips from experts in the automotive industry designed to help you maintain 18 different parts of your car in the sweltering heat. 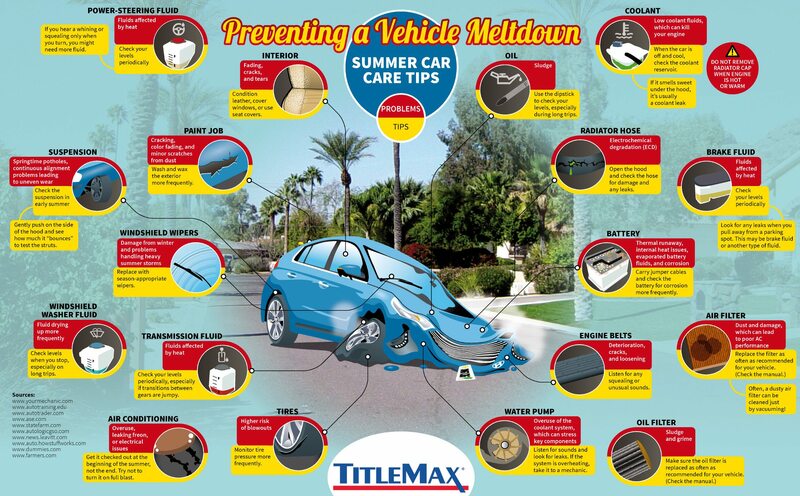 Don’t let your car go into a meltdown, know the signs and beat the heat! Did you know you should check your car’s fluids more often in the summer? Fluids are more prone to evaporation and can become less effective when exposed to higher temperatures. Did you know there is a higher risk of tire blowouts in the summer heat? Make sure to check your tire pressure more frequently! Did you know warmer temperatures and intense sun can cause cracking and fading in your car’s paint? Even your paint job isn’t safe! See if it creeps into the red or “warning” area. Turn off your AC system if the temperature gets too high. Consider turning on the heat; it will pull heat away from the engine. When you’re sitting in traffic, shift into neutral and rev the engine. This speeds up the water pump. If you see smoke, always safely pull over. White smoke is water or coolant burning off. Wait and consider calling a tow truck. If it’s still smoking, do not remain in the vehicle. Be careful while exiting. Let the engine cool for at least a half-hour. Make sure you have flares or lights to ensure that you won’t get rear-ended on the road. Do NOT remove the radiator cap! If you must remove it, wait an hour or until the engine is completely cool. Pull it off with a rag to protect your hand and open it away from you. Refill coolant in the coolant overflow container if there is one. Do NOT pour cold water into a hot radiator. Use your eyes and nose to check for leaks. Coolant has a sweet smell. Often, you will see a puddle under your car. Consider driving again only if you’re confident that you can make it to your location on the coolant you have. Repeat the process if the problem continues, and call for help. Often, there’s only so much you can do safely on the side of the road.